A couple months ago I made the Swoon block and fell in love. But it is really a mock version of the Star of Magi block, which is based on an eight-point star grid system, and requires several Y-seams to joint the patches together. It is a lovely block, but I found no detailed instructions on making it, and I had to figure it out all by myself. It was a fun but challenging process since I had never done Y-seams previously. Now, I have pieced tens of Star of Magi successfully, and I would love to share with you how I make them easily without any marking or difficult measuring/cutting involved . My method was inspired and derived from Sharyn Craig and Harriet Hargrave. In their books The Art of Classic Quiltmaking and Quilter's Academy Vol. 4 - Senior Year, very detailed instructions are given on how to construct the LeMoyne Star in the no marking way. I personally dislike marking dots to indicate beginning/ending of 1/4" seam line because it slows down the piecing procedure, and introduces another source of error/imprecision. A basic sewing machine that can produce perfect 1/4" seam allowance. A fast-fade or water-soluble pen (Note: not for making dots...). 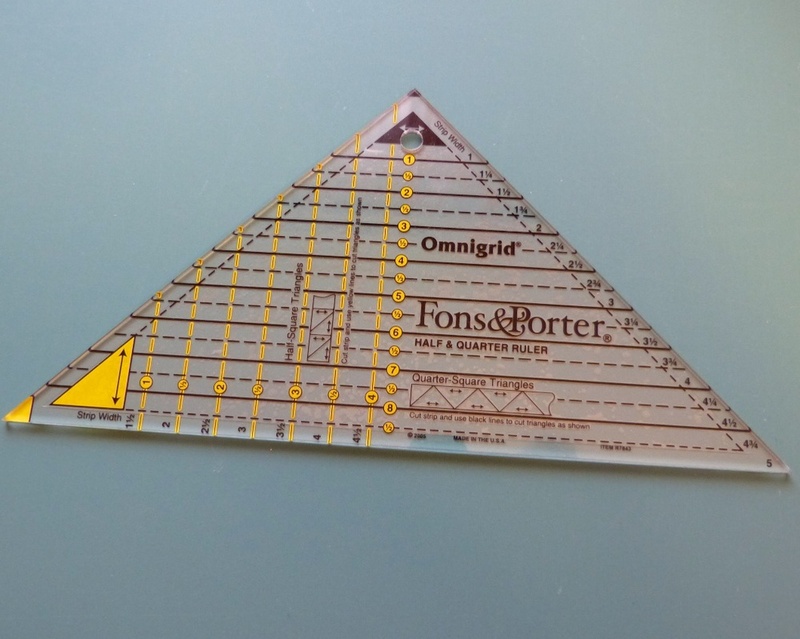 A Quarter Triangle Ruler and a straight ruler with 45 degree makings would make the cutting fast and easy. 14.5" is just the perfect finish size for Star of Magi. It makes the cutting of all patches within the 1/8" realm. No 1/16" or 1/32" at all! Indeed, the finish measurements of the half-prisms are 3" wide, the diamonds are 2" wide, and the quarter-triangles are 1.5" by 3" - all approachable numbers! With white tone fabrics, use the triangle ruler to cut 2" wide strips, and sub-cut to yield 24 quarter-square triangles (8 for inner round and 16 for outer round). With blue tone fabrics, use the straight ruler to cut 2" wide strips, and sub-cut to yield 12 diamonds (4 for inner round and 8 for outer round). With yellow tone fabrics, use the straight ruler to cut 2" wide strips, and sub-cut to yield 4 diamonds. With red tone fabrics, use the straight ruler to cut 3.5" wide strips, and sub-cut to yield 8 4-1/8" long rectangles. Then, use the triangle ruler to trim two corners to make the half-prism shape. 1. With A on top of B, stitch from edge to edge. 2. With A on top of C, stitch from edge and end with back-stitching or back-tacking right before Seam AB. Do not stitch beyond the stitching of Seam AB and do not sew over seam allowance. To see the seam line clearly, highlight the end portion of Seam AB with a fast-fade or water-soluble pen so when you see the needle approaching to the marking you will know that it's time to stop. 3. In a similar manner, with C on top of B, joint BC. You may want to unpick the first two or three stitches of Seam AB with a seam ripper to let C lay smoothly on top of B. 4. Press Unit 1a as shown. I recommend press with a hot, dry iron. Steams may distort the unit as some patches are cut on the bias. Hint: Chain-piece to speed up! Follow the instructions given for Unit 1a, make four Unit 2a. Look at how the seam allowances spinning and fanned at the centre. It is flat and crisp!